You may have heard more than you care to hear about electronic records submission. It’s possible that a number of you have not made your electronic submissions to the Occupational Safety and Health Administration (OSHA) because you think that the standard does not apply to you or because you do not know what to submit. To add to the confusion, OSHA has recently changed the area of the website where the electronic filing is to be made. Further changes to the web navigation are possible, so the instructions below are offered as a general guide. On the OSHA home page (www.osha.gov), click on the Employers drop-down menu at the top and then on Record-Keeping Requirements and Forms. On the next web page, look for the heading “Electronic Submission of Records” and a link to the Injury Tracking Application (ITA) launch page. That link will connect you to a web page presenting a summary of the final rule. At the upper right appears a blue rectangle labeled “Launch ITA.” Clicking on that link will take you to the Injury Tracking Application Login page, where you will be given the necessary guidance to make an electronic submission. Another method is to use the search box on the upper right section of the OSHA home page. Type “electronic record keeping” into the search engine, click on the search icon (the magnifying glass), and you will be taken to a page containing a list of topics. One topic currently listed is “Record Keeping/Injury Tracking Application (ITA)”—look for “Electronic Submission of Injury and Illness Records to OSHA” in the explanatory copy. Clicking on that link will take you to a page with the words “Launch ITA” in a blue rectangle at the upper right. Click on that box, and you will arrive at the Injury Tracking Application Login page. As for what you need to file: every company that had 20 or more employees in 2016 must electronically file the OSHA 300A form that was required to be posted in the workplace between February 1 and April 30, 2017. On July 1, 2018, employers with 20 or more employees in 2017 will electronically submit the 300A form that they posted between February 1 and April 30, 2018. If your company has 250 or more employees, you will have to file additional materials on July 1, 2018. You will need to electronically submit, in addition to the 300A form, the OSHA 300 forms for 2017 and all your OSHA 301 accident reporting forms for 2017. OSHA also provides a helpful list of frequently asked questions and answers concerning the record-keeping requirement at www.osha.gov/recordkeeping/finalrule/finalrule_faq.html. As you know, the electronic record-keeping provision also contains language prohibiting retaliation against an employee. The employee who reports an injury engages in protected activity. You can be found to have retaliated against employees if you took action against them because they reported an injury, but you can also be charged with retaliation if you take action against an employee because of the manner in which he or she reported an injury or because the injury arose from a safety violation. By now you may be asking, “How can I enforce my safety program if I have to continue to be concerned about being accused of retaliation?” The answer is quite simple: as long as you treat all employees the same, whether or not they are reporting an injury, you will not have any problems. For example, if an employee fails to wear safety glasses and gets a foreign object in the eye and you take disciplinary action against the employee, you may be accused of retaliation. You will be vulnerable to this accusation unless you can demonstrate that you enforce all your safety rules—including the rule about safety glasses—for all employees, whether or not they have an injury. You must treat all employees the same. You can also be charged with retaliation against an employee if your actions are based on the fact that the employee did not comply with an arbitrary requirement regarding timely reporting or the manner in which the report has to be made. You may require employees to report on-the-job injuries and illnesses as soon as possible or practical after the event occurs, but you may not establish an arbitrary time limit, such as within 24 hours or before the end of the shift. Finally, you can be accused of retaliation by employees for maintaining a safety incentive program that is based on having no recordable or reportable injuries within a certain time period. Safety and health regulations related to fall protection appear in subpart M of Section 1926 of the Code of Federal Regulations. Section 1926.501(a)(2) is a little-known section of the subpart because almost everyone focuses on the specific requirements for fall protection, which are found in the standards of the subpart. OSHA is becoming more vigilant about the obligation to ensure that walking and working surfaces have the strength and structural integrity to support employees safely. This determination must be made before employees are permitted to walk on the walking or working surface. In the post-frame industry, this situation can arise during installation of a second or third floor or when roof sheeting is being applied on top of the trusses before the roof is shingled or finished. Each day before any employee is permitted to walk on that roof sheeting, or on the initial layer of decking on a mezzanine or a second or third floor inside the building, the employer must determine the integrity of that area and its ability to support the weight of any and all employees who will be working there. It is difficult to do this without having somebody walk over the walking or working surface. Of course, that individual must be wearing fall protection to prevent him or her from falling to a lower level or to the ground if the walking or working surface being checked fails under the person’s weight. An initial determination can be made during a careful examination of the material being put in place prior to having an employee walking or working on it to assess whether it will be solid enough to support the weight of employees. In addition to this precaution, you must also, as part of this determination, ascertain that the decking or roof sheeting is sufficiently secured so that it will not shift under the employee’s weight and result in a fall. I strongly suggest that you maintain a record of what was done to meet this requirement and have the employee who made the determinations sign off on it. I have handled several legal cases that involved alleged violations of this standard. Most resulted after an employee fell through a roof or floor. As OSHA becomes more aggressive in this area and demands proof that you have made the required determination, even without an injury, we could see citations being issued without the occurrence of an injury. On the basis of my experience, I have concluded that just looking at the underside of a roof deck, although a good first step, in many cases will not be sufficient to determine conclusively the integrity of that roof to support the weight of employees working on it, even if a written record of the inspection is maintained. I recommend instead that an employee (preferably the supervisor) walk the surface of the area in which work is going to be performed, whether it is roof decking or initial flooring of a mezzanine or a second or third floor, prior to having employees walk on that roof or floor. The employee performing this inspection will need to be tied off and protected from any potential fall in the event that the floor fails. The standard concerning respirable crystalline silica applies to all construction industry employers, and it applies regardless of whether you expect respirable crystalline silica to be present in the breathing zone of your employees. 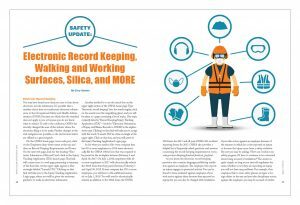 In most post-frame construction projects, respirable crystalline silica is not going to be an issue, but if concrete is involved in the construction or on the jobsite, it could be. Also, if your company’s employees are working on a job site with workers from other employers and one of them is working with concrete or another material that generates respirable crystalline silica, the standard may apply to your company as well because of their activities. For this reason, all construction industry employers are required to have a competent person who is capable of determining whether this new standard applies to their business on the job site. This competent person must have training beyond what is usual: the person will need to be aware of the standard concerning respirable crystalline silica, what it requires, and how to make an initial determination regarding potential exposure for the workers on the site. This standard went into effect for the construction industry on September 23, 2017, and OSHA began enforcing it on October 23, 2017. For general industry, the standard will take effect on June 23, 2018. It’s important to note that not all silica is respirable crystalline silica. 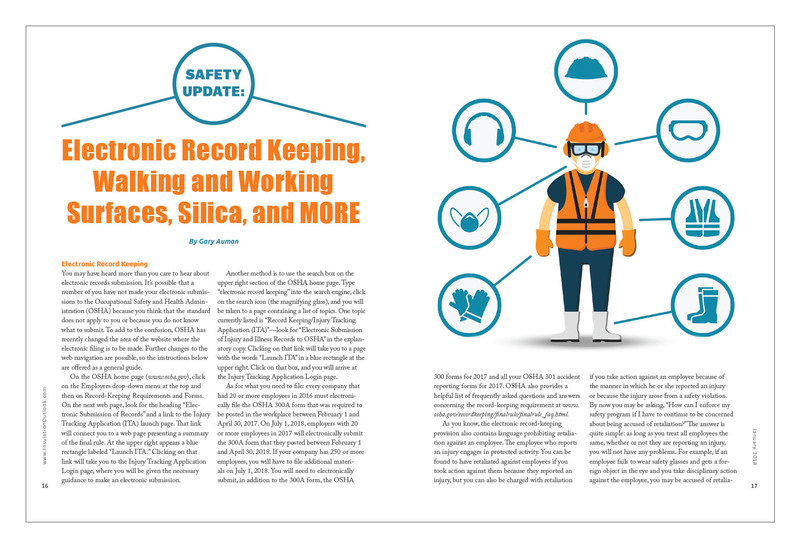 Respirable crystalline silica must have the components of quartz, cristobalite, or tridymite. These components can be found in concrete decking, cement tiles, shingles, and roof tiles. So if you are putting a roof on a post-frame structure and using roof tiles, you need to determine whether respirable crystalline silica is a component of those tiles. It is the responsibility of the competent person to make this initial determination. This standard is extremely complex and detailed. Much construction work takes place close to municipalities of some size. In most cases, an emergency squad is located within 5 or 10 minutes of the job site, and such a squad typically has a certified paramedic, emergency medical technician, or other trained provider. If you are working on a rural site and a hospital, clinic, or infirmary is not “reasonably accessible,” under this standard you are required to have a certified first-aid provider on site. The training of that first-aid provider must be verified by documentary evidence that you can provide to an OSHA compliance officer who might request it. This raises the question of whether having an emergency squad in close proximity to the job site is sufficient, if it would still take more than 15 minutes to get an injured worker to an infirmary, clinic, hospital, or physician. This standard was last amended on June 18, 1998. Twenty years ago, when this standard was first promulgated, emergency squads may not have been staffed by certified EMTs or paramedics. It would seem that having a certified EMT or paramedic within 10 or 15 minutes of a job site would be preferable to having a first-aid-trained employee who has an opportunity to use his or her training only every few years. But employers must comply with the standard as it is written. Therefore, if you want to avoid a citation when an inspection occurs, you will need to have someone on site who has been trained by the U.S. Bureau of Mines, the Red Cross, or another training program such as the National Safety Council. Ensure that the training can be verified by documentary evidence on the site whenever a crew is working there. No one can predict what an OSHA compliance officer will ask for during a visit to a job site. Some are much more detail oriented than others. In addition to having the trained first-aid person on the site, you must also have first-aid supplies easily accessible on the site. The contents of a first-aid kit must be checked by the employer before it is sent out on each job and at least weekly on the job site to ensure that any items used have been replaced. In addition, the standard requires that “proper equipment for prompt transportation of the injured person to a physician or hospital, or a communication system for contacting the necessary ambulance service, shall be provided.” Also, in areas where 911 service is not available, the telephone numbers of physicians, hospitals, or ambulances must be conspicuously posted on the job site. This provision demonstrates that the drafters of this standard and the amendments took the use of an emergency squad into consideration. However, the first-aid requirement remains. A related concern is exposure to contamination. The person designed to be a provider of first aid may reasonably expect to be exposed at some point to contaminated body fluids. The requirements of the blood-borne pathogens standard now come into play, and employers are required to properly supply and staff the job site to meet the requirements of that standard. Another standard that often receives little consideration in the construction industry is 1926.51, titled simply, “Sanitation.” The standard requires that all places of employment have an adequate supply of potable water. Employers are also required—in Section 1926.51(b)(1)—to post signs identifying the outlets for any nonpotable water on the job site. Typically, nonpotable water is considered water that is to be used for industrial use or firefighting purposes only. If you are on a farm or another agricultural location, nonpotable water could also be water that is pumped from a pond or a stream and used for hosing down the concrete floors of a barn or for irrigation. The signs on the nonpotable water sources must warn employees not to drink that water; and they must indicate clearly that the water is unsafe and shall not be used for drinking, washing, or cooking. In addition, you may not have any cross-connection, open or potential, between a system furnishing potable water and a system furnishing nonpotable water. Even if you bring potable water to the job site, you must label any outlets for nonpotable water. Section 1926.51(e) covers toilets at construction job sites. This section requires that at least 1 toilet be provided for employees on any construction site. Under 1926.51(f)(3), lavatories are to be made available in all places of employment. The requirements of this standard do not apply to mobile crews or to normal unattended work locations if employees working at these locations have readily available transportation to nearby washing facilities. Each lavatory must provide hot and cold running water, or at least tepid running water. Hand soap or similar cleansing agents shall also be provided. I have had to address a citation involving this standard for a client in the state of Indiana. The Indiana OSHA branch cited my client because portable restrooms on the job site did not provide hand soap or similar cleansing agents and did not have running tepid, hot, or cold water. This standard also covers shower, handwashing, and eating facilities. You need to be in compliance with these requirements in all cases where you either voluntarily provide or are required to provide these facilities. I direct your attention to these 2 standards for more details on emergency medical care and sanitation. Through personal experience, I know that OSHA issues citations for violations of these standards. All the standards covered in this article are extremely important to construction industry employers. I urge you to review the standards published on the OSHA website and do whatever is necessary to ensure that your company is in compliance with the requirements they contain.